In the year 2000, before there was Whole Foods and luxury condominiums in the Pearl, a friend and I opened up a tiny little cafe across the way from Powell's Books. We named it Half & Half. We made a wren our mascot, had a taxidermy display, sold cigarettes and fluffernutter sandwiches, and didn't put out a tip jar until our customers yelled at us. We were the only coffee shop selling Stumptown coffee in a 5 mile radius. A lot has changed in 10 years. I like to think that Half & Half contributed to the food and arts culture in more ways than just making great pie and deviled eggs. We invented more than 300 sandwiches, and painstakingly named every single one. We sold coffee delivered to us by bicycle. We made iced sweet tea for all you displaced southerners. We served unemployed musicians, artists, architects, students, strippers, construction workers, freaks and ad-folks with equal zeal. You can find us in a YACHT video, a Gus Van Sant movie, and a TV spot for the Oregon Lottery. If it wasn't for Half & Half, I probably wouldn't be working at Wieden + Kennedy. And now, after 9 years and 7 months in business, we are closing shop. On April 30th, we will make our batches of deviled eggs and iced coffee and we will say goodbye to a community that helped create some of the best 500 sq feet the world has to offer. 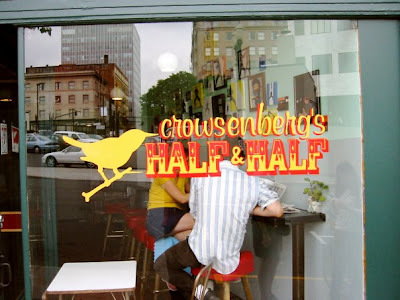 Half & Half could not have existed in any place but Portland, in any time but the last decade, and without the customers and staff who supported and sustained it. In the next 2 weeks, I hope you have the chance to eat or drink there for your first or last time. On April 30th we're taking customer portraits outside the cafe and we'll be making sandwiches, deviled eggs and serving Miller High Life until we run out of inventory. We have the space till midnight, so let's see what happens. Courier Coffee Roasters will be taking over the space at 923 SW Oak. We've been serving Joel Domreis' hand roasted, bicycle-delivered coffee since 2007 and I know the neighborhood is in excellent hands.